Seven senior leaders from the Delhi unit of Bahujan Samaj Party (BSP) today left the party and joined the Congress. Former Delhi BSP president Jagiram Bhati, East Delhi in-charge Arif Mohammad, general secretary Ashwini Bagri, North-West parliamentary constituency in-charge Raju Rana Concillor and president of Brahman Bhaichara Committee Mahabir Sharma resigned from the BSP and joined the Congress. Doctors at the city hospitals have a big problem to grapple with now —false claims for compensation. While working for more than 12 hours a day to provide medical assistance to the wounded in the serial blasts, the doctors complain that there are many trying to make a quick buck out of the tragedy. A meeting was held today between E.Sreedharan, managing director, Delhi Metro Rail Corporation and R.K. Das, director general, Central Industrial Security Force, to review the security status of the Delhi Metro. The meeting was attended by senior officers from the DMRC, CISF and the Delhi police. To provide relief to people, Haryana Janhit Congress chief Kuldeep Bishnoi today demanded rollback of oil and LPG prices in the country as these have come down in the international market. Dengue has spread its tentacles in Noida and Greater Noida due to lack of proper facilities. The mosquito-borne menace has already affected most of the rural areas. Twenty dengue patients are undergoing treatment at various hospitals in G.B. Nagar district. Medical Relief and Public Health Committee chairman V.K. Monga today claimed that the Municipal Corporation of Delhi (MCD) hospitals were fully equipped with facilities to treat dengue patients. 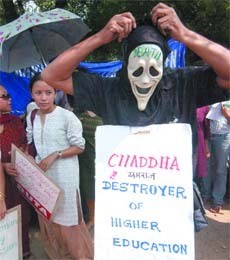 IGNOU has announced two new advanced programmes on women studies and research. The programmes are especially targeted at alleviating women’s backwardness. A car, allegedly being driven at a reckless speed, fell 50 ft down after hitting the side railings on the Expressway at around 8 pm on Tuesday. The incident took place over the underpass on the Expressway on Sultanpur village. The crime branch of the Delhi police has arrested a Central Industrial Security Force (CISF) trooper for allegedly collecting money in the name of Congress president Sonia Gandhi’s political secretary Ahmed Patel. A debt-ridden real estate developer has been arrested here for killing his wife and two-and-half-year-old daughter and attempting suicide in his rented South Delhi home, the police said on Wednesday. Syed Abbas smothered his wife Neelam and daughter Jaenab with a pillow and later attempted suicide by slashing his wrist with a knife and blade at his first floor house in the Maharani Bagh area last month. The police rushed him to the All India Institute of Medical Sciences where doctors performed surgery on his hand. He gradually recovered from his injuries. A city court today deferred by a day the anticipatory bail plea of Utsav Bhasin who last week allegedly rammed into a motorcycle while driving his BMW and injured two people, one of whom has died. Chief Minister Sheila Dikshit has appealed to the residents of unauthorised colonies not to get carried away by the misleading statements issued by people not interested in development process. A ‘mushaira’ was organised on the occasion of 16th Global Conference on Mysticism last week. It was inaugurated by Sant Rajinder Singh Ji Maharaj, president, World Council of Religions at Kirpal Bagh, Delhi. 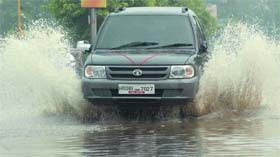 As heavy rain lashed the city today evening, waterlogging and traffic snarls were reported from various areas. According to a Municipal Corporation of Delhi (MCD) official, waterlogging was reported from ISBT Ring Road. Seven senior leaders from the Delhi unit of Bahujan Samaj Party (BSP) today left the party and joined the Congress. Former Delhi BSP president Jagiram Bhati, East Delhi in-charge Arif Mohammad, general secretary Ashwini Bagri, North-West parliamentary constituency in-charge Raju Rana Concillor and president of Brahman Bhaichara Committee Mahabir Sharma resigned from the BSP and joined the Congress. They said that they were fed up with the policies of the party. The BSP chief had asked for money in lieu of ticket for the Delhi assembly elections. This is routine in the party. Whether a senior or a junior, one has to pay for getting ticket. Everybody is at the mercy of party chief Mayawati, they alleged. When asked if they would contest the elections on Congress ticket, the leaders said that they had not joined the party to contest elections. They would work for the party during the elections. They said that the Congress was the only party where money was not taken from ticket seekers. The leaders joined the Congress in presence of Chief Minister Sheila Dikshit, East Delhi MP Sandeep Dikshit and Delhi urban development minister Raj Kumar Chauhan. A senior Congress leader said that the development would help the party in getting the BSP vote bank. So far BSP has no MLA in the Delhi assembly. This would be the first election experience for the BSP in Delhi, he said. However, the Chief Minister did not comment on the issue. When asked about the terrorist activities in Delhi, she said that this should not be made election issue. People should have sympathy with the bomb blast victims. As far as the law to control terrorist activities is concerned, the country already has such laws. Parliament will further frame strong laws in this context, she said. Doctors at the city hospitals have a big problem to grapple with now —false claims for compensation. While working for more than 12 hours a day to provide medical assistance to the wounded in the serial blasts, the doctors complain that there are many trying to make a quick buck out of the tragedy. “People are doing all sorts of things either to claim false compensations or for some other monetary benefits. I am disturbed,” said Dr. SK Sharma, chief medical officer (CMO), Ram Manohar Lohia Hospital (RMLH). For instance, 35-year-old Vinod Kumar turned up at the RMLH today seeking compensation, claiming he was among those injured in the serial blasts. “Someone told him that we would give him money if he claimed that he was injured in the blast. I was shocked to learn that and immediately sent him to the hospital police booth,” said Dr. Sharma. 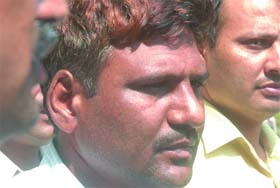 The police said that Vinod was injured in a separate road accident on the day of the blasts and his claims were baseless. In another incident, one Bipin Rawal claimed that he was discharged from RMLH without proper treatment on Saturday itself. “He came to the hospital to put his name on the compensation list. I asked him for the discharge slip of the hospital but he could not produce it or any other document from the hospital,” said Dr. Sharma. He also claimed that his X-ray at Ayushman Hospital in Dwarka showed splinters inside the wound and he had to undergo an operation at the private hospital. The doctors said that there were several others with minor injuries, who had been coming to the hospital, complaining that they were not given proper treatment. This way they could claim compensation as well. “There were three more cases of this nature. Some attendants came to me telling me that someone took money from them claiming that their patients needed medicines,” said Dr. Sharma. The hospital authorities later informed the attendants that all medicines were provided by the hospital to the patients admitted in the emergency. “While we condemn the terrorists for what they are doing, we also need to take a look at ourselves. I wonder how people allow themselves to stoop to such levels at sensitive times like these,” said Dr. Sharma. A meeting was held today between E.Sreedharan, managing director, Delhi Metro Rail Corporation (DMRC) and R.K. Das, director general, Central Industrial Security Force (CISF), to review the security status of the Delhi Metro. The meeting was attended by senior officers from the DMRC, CISF and the Delhi police. In the meeting, it was decided to increase the number of dog squads, strengthen bomb disposal teams, increase the supply of bomb blankets and add more door frame metal detectors (DFMDs) on the Metro system. It was also decided to purchase more powerful search lights called dragon lights, procure more communication equipment (TETRA radio sets), additional baggage scanners to automatically scan luggage and optimise the requirement of close circuit TV cameras for Phase-II. The DMRC has already ordered 6 new baggage scanners, which will be used primarily at stations such as New Delhi, Old Delhi, Chawri Bazar and Rajiv Chowk, where more passengers come with luggage. The DMRC has also started making preparations to build kennels for the dogs which will be procured by the CISF for Metro security. In addition, the DMRC will also launch a special drive to promote awareness among the commuters as “with 8 lakh passengers traveling on the Metro everyday the DMRC has 16 lakh eyes and ears who can look out for any unidentified object or suspicious person indulging in any dangerous activity,” said Sreedharan. The DMRC will also be distributing pamphlets and making films to spread awareness among commuters. In Phase-II, the DMRC will install 3,000 close circuit televisions at the stations apart from the cameras inside the trains. The DMRC will also be removing flowerpots and litter bins from the concourse area of the station and will sensitise the shop owners operating inside Metro premises about the need to be more vigilant at all times. 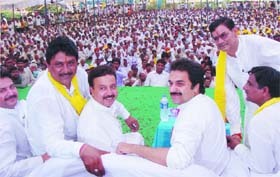 Addressing a public rally organised at Wazirpur in Badshahpur assembly segment as part of his party’s preparations for the next Lok Sabha election, Bishnoi said that prices of oil witnessed 40 per cent decline in the international market, so the UPA government should also lower the rates of petrol, diesel, LPG and kerosene. He lashed out at the UPA government for not acting in the public interest as it always maintained that rise in international prices necessitated hike in the prices of these items. “What stops the government of rolling back the repeated hike in prices when the rate of a barrel has come down to 90 dollars from 150 in the international market,” he asked. Bishnoi decried the reported statement of the union minister Murli Deora that rollback was not feasible in view of devaluation of rupee. Terming the statement as misleading, he argued that the government had huge foreign exchange reserves and any loss due to rollback could be balanced by using these forex reserves in the larger public interest. The former Bhiwani MP also took the state government to task for not restoring supply of kerosene to ration card holders through public distribution system. He termed the government step as anti-poor as most of the card holders were poor people who could not afford other cheaper fuel for cooking and other household purposes. Before a predominantly rural audience in the rally, he asked the union government to cancel all the SEZs which were evading taxes in spite of enjoying various tax exemptions and other incentives. He based his demand on the report of a government-sponsored survey of 27 SEZs operative in the country. The report, as per Bishnoi, showed that 90 per cent of them were not fulfilling the government norms including tax evasion. He also announced that if his party formed the next government in the state, it would create provision under which if any farmer did not accept compensation, his land would be automatically released from the acquisition order. Apart from him, HJC candidate from Gurgaon Lok Sabha seat Rao Narvir Singh, urban and rural district units presidents Kanhiya Lal Pahwa and Mahesh Daima also addressed the rally. Dengue has spread its tentacles in Noida and Greater Noida due to lack of proper facilities. The mosquito-borne menace has already affected most of the rural areas. Twenty dengue patients are undergoing treatment at various hospitals in G.B. Nagar district. Nine confirmed dengue patients each in Noida and Greater Noida hospitals are under treatment. Surprisingly, the district health department has so far confirmed only three patients to be suffering from dengue. But a visit to city hospitals like — Fortis, Kailash, Metro, Vinayak, Sumitra and Rohtash Nursing Home present a different picture where dengue patients are undergoing treatment. There are at least 20 patients in Prakash Hospital with symptoms of dengue fever. At government-level nothing much is being done except spraying insecticide in the town once in a while for preventing the onslaught of dengue. With government hospital and health department lacking necessary facilities and equipment for fighting dengue, it may take the form of an epidemic. According to Dr Vinode, four dengue patients are undergoing treatment in government hospitals. In Metro Hospital, many patients are having dengue symptoms, said Dr Purang. In Rohtash Nursing Home, three patients are under treatment, said Dr N.K. Sharma. In Greater Noida nine patients have been found to be suffering from dengue positive. Seven out of them are in Kailash and two in Sharda hospital. Absence of a blood bank in the city is also causing serious impediments in their treatment. There are over three dozen viral patients in city hospitals, many of them with very low platelet count. According to Dr Sunil Kapoor, seven dengue patients are under treatment while two dozen viral patients have been admitted in Kailash Hospital. Dr Pankaj Bansal of Sharda Hospital said that there were two dengue patients and 24 viral fever patients in the hospital. Private hospitals have posted the CMO with the details of dengue patients. CMO Dr S.L. Mishra said that they were keeping an eye on the incidence of dengue. All necessary steps are being taken in this connection. He said that till September 16 a total of 275 dengue cases had been reported which were more than the previous year. The increase in the number of cases was due to the early onset of rains and subsequent intermittent rainfall, which lead to the increase in the number of mosquito breeding places. Moreover, owing to the improved disease surveillance, more and more private medical institutions have started reporting dengue cases. IGNOU’s Schools of Continuing of Education (SOCE) and Social Sciences (SOSS) yesterday signed an MoU with the Centre for Women Development Studies (CWDS) to launch MPhil and PhD programmes, which aim at empowering the mission towards gender equality. According to the MoU, the CWDS–a premier research organization will coordinate with SOCE and SOSS to develop a unique programme for the MPhil and PhD degrees in studies on ‘Woman’. A joint coordination committee chaired by the IGNOU vice-chancellor and co-chaired by CWDS director will monitor various aspects of the programmes. The examination and certification will be done according to the IGNOU norms. The copyright on the study material will be retained by IGNOU, even as CWDS’ role in them will be acknowledged. The CWDS coordinates with other agencies and organizes training programmes for scholars, researchers and cooperatives on issues relating to women. In collaboration with other agencies, the CWDS develops educational training and action programmes for underprivileged women. The thrust areas of the women studies will be income generation programmes—such as vermiculture, self-employment scheme on a cooperative basis, etc. A car, allegedly being driven at a reckless speed, fell 50 ft down after hitting the side railings on the Expressway at around 8 pm on Tuesday. Arjun Singh, 23, a first year MBA student of Amity University, who was driving the car, was killed on the spot. The incident took place over the underpass on the Expressway on Sultanpur village. Arjun was rushed to Bhardwaj Hospital in Sector-29 by the highway patrol, but was declared brought dead. Arjun was driving an Opel car (No. HP03-3586) belonging to his friend, Viplav, a BBA student. According to Chhaya, Arjun’s teacher, the accident happened while Arjun was trying to avoid a punctured WagonR parked across the Expressway. However, according to the police, Arjun was driving the car very fast. The speed of the car was so high that after breaking the railings, it fell some 40 meters away from the road rolling and spinned a number of times. It is being said that lack of streetlight on the Expressway caused the accident. Arjun originally belongs to Lucknow. His father R.K. Singh owns tea gardens in Assam. Arjun’s body has been kept in Kailash Hospital. It will be sent for autopsy after the arrival of his family members. According to the police, a CISF constable, Hansraj Kuldeep, who is posted in the VIP security, was arrested last evening from Ghaziabad. The crime branch is also looking for his accomplice in the crime, Nand Lal, an ex-CISF constable who was suspended from the services for bad conduct. Hansraj told the police that he had learnt to speak like VIPs after hearing them speak on their mobiles and this helped him to convince people that he was indeed someone close to Ahmed Patel. He would tell people to deposit money for the Rajiv Gandhi Foundation in his bank account. One of the people called by Hansraj informed Ahmed Patel about it and Patel had complained to the crime branch. According to the police, Hansraj had convinced five persons to deposit money in his account and one of them had even deposited Rs 50,000. A debt-ridden real estate developer has been arrested here for killing his wife and two-and-half-year-old daughter and attempting suicide in his rented South Delhi home, the police said on Wednesday. Syed Abbas smothered his wife Neelam and daughter Jaenab with a pillow and later attempted suicide by slashing his wrist with a knife and blade at his first floor house in the Maharani Bagh area last month. The police rushed him to the All India Institute of Medical Sciences (AIIMS) where doctors performed surgery on his hand. He gradually recovered from his injuries. According to police officials, Abbas was under immense pressure to repay loans. But knowing his inability to repay, he had asked his wife to write her suicide note and said they would both end their lives together. “Once Neelam wrote her note, Abbas killed both her and the daughter and then attempted suicide,” said deputy commissioner of police H.G.S. Dhaliwal. Additional sessions judge Brijesh Garg adjourned the hearing on Bhasin’s plea as the parties failed to produce the order of the Delhi High Court. “This court wants to see the observations of the High Court on the petition filed by Rajender Singh, father of victim Anuj Singh,” he said. The High Court had also issued notice to the Delhi Police to file its reply by September 30. Bhasin, son of a Haryana industrialist, now faces stringent penal provisions as police has amended the charges against him in the first information report (FIR). It includes the clause of Section 304 (culpable homicide not amounting to murder), a non-bailable offence, of the Indian Penal Code. Earlier, it was filed under Section 279 (rash and negligent driving) and 337 (causing hurt and endangering life). Earlier, during the hearing, Bhasin’s counsel Ramesh Gupta said that Section 304 was invoked by the police on their own and the High Court had not said anything on the matter. 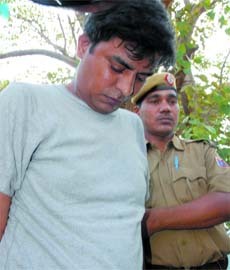 Police has already seized Bhasin’s passport on the direction of the Delhi High Court. She added that such statements are meant to create confusions and obstacles in the regularisation process that has reached its final stage due to the efforts of the city and the union governments. She said that her government would be able to fulfill the aspirations of 50 lakh poor and middle-class residents of unauthorised colonies. Describing the statement about the cancellation of distribution of provisional certificate as baseless, she said that the scheduled distribution on September 17 had just been postponed and not cancelled. Janab Bekal Utsahi, Janab Afzal Manglori, Shamsh Tabreji, Abid Karhani and others participated in the Mushiara. Delhi, Richard Dworsky, USA, Cesar Beltran, South America, Helga Kammerl, Germany, paid rich tributes to Sant Darshan Singh. 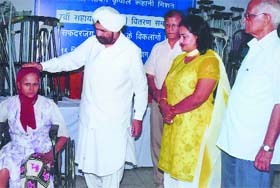 large number of aids and appliances were given to the disabled and needy patients of the Rehabilitation Department of Safdarjung Hospital. The appliances included wheelchairs, tricycles, sewing machines and walking sticks. As heavy rain lashed the city today evening, waterlogging and traffic snarls were reported from various areas. According to a Municipal Corporation of Delhi (MCD) official, waterlogging was reported from ISBT Ring Road, Nigambodh Ghat, Raj Ghat, Guru Nank Chowk behind Pant Hospital, Bhairo Road, Punjabi Bagh Ring Road, Bhajanpura, Brijpuri, Ghazipur Chilla village, Dilli Gate, Jhandewalan roundabout, New Delhi railway station, Kela Ghat, Hyundai showroom in Sarita Vihar, Mayapuri flyover, Raja Garden flyover, Kailash Nagar Pushta Road and five Foota road.